Thu., Aug. 10, 2017, 6:01 p.m.
From walk-on to scholarship athlete. Check. Budding entrepreneur with a potentially successful business already on the way. Check. A great outlook on life. Check again. There’s hardly a box Ed Hall hasn’t checked off in getting the most out of his college experience. Hall walked onto the University of Idaho football team in 2014 after high school in Chugiak, Alaska. A junior, he is a starting linebacker who finished fourth on the team with 70 tackles last season. He’s confident enough as a scholar to major in mechanical engineering, and he and friend and roommate Alex Boatman, a Vandals long snapper and junior from Lewiston are already planning for life after college by working to develop a shower targeted to recreational vehicles that uses filtered, recycled water. Their project, Forever Showers, has already won $13,000 in business competitions, Boatman says. Vandals coach Paul Petrino breaks out in a grin when he discusses Hall. To some extent. The list of Vandals from Alaska includes former NFLers Mark Schlereth and Mao Tosi, but Hall followed another Alaskan to Moscow. JaVonte Dunn, a friend from Eagle River High School, played one year of football for Idaho. “I knew I could play, too,” Hall said. So he investigated the UI engineering school, was pleased with the quality of what he found there, applied and was accepted. Then he sent the Vandals a highlight tape and was invited to walk on. Petrino now finds himself with a heady linebacker who runs like a deer and who’s next frown or moment of indecision will likely be his first. This is a good guy to have in the locker room. 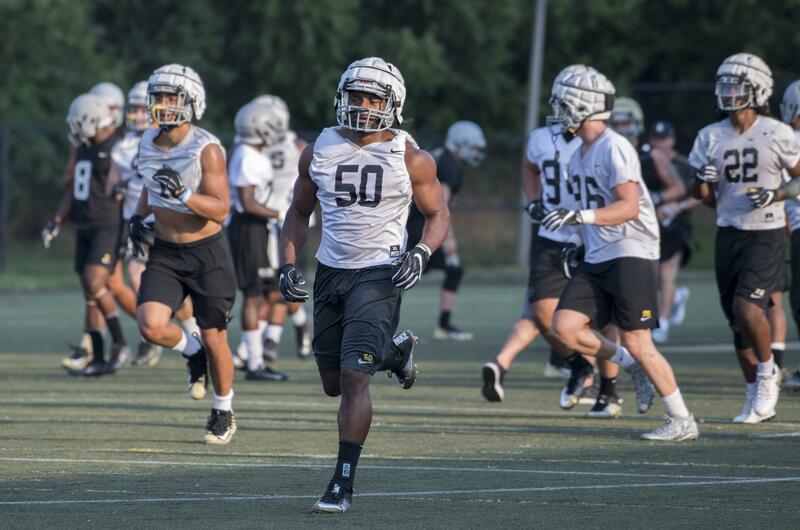 After the Vandals’ breakout season in 2016 that saw them win nine games, including a bowl game, Hall sees an even more improved product on defense in preseason camp. “There’s a better feeling to start out with. People are not mopey. We were getting rid of that mopey attitude last year. It is definitely gone this year,” he said. For a role model in getting things done, the Vandals can instead look to their cheerful, confident teammate from Alaska. A challenge for Hall this year will be balancing football with a particularly tough engineering class featuring multiple homework projects and quizzes for every class session. “I can handle it. I might lose a few hours of sleep, but I can handle it,” he said. His own role model set a high standard for Hall to pursue. His brother, Zerbin Singleton, is a U.S. Marine Corps helicopter pilot who graduated from the U.S. Naval Academy and played football there after taking a year off following high school to recover from injuries suffered in a car accident. So shoehorning an athletic career, an engineering degree and a business enterprise into his schedule is no more than to be expected for Hall. This allows him to take advantage of a stroke of luck. Boatman, a finance major, took a class that included some engineers working to develop the recyclable shower. “I took this class, met these people, and I brought Ed along,” he says. Forever Showers could be ready to go to market in 10 months, Boatman guesses. A year from then it could be going well enough to provide Hall and Boatman careers about the time they graduate from Idaho. That’s a line Petrino could use, as well, in talking about Ed Hall. Published: Aug. 10, 2017, 6:01 p.m.